the Year: Pantone's Pressed Rose or Living Coral. Of course, I was happy to join in. Thank you for inviting me, my friend! 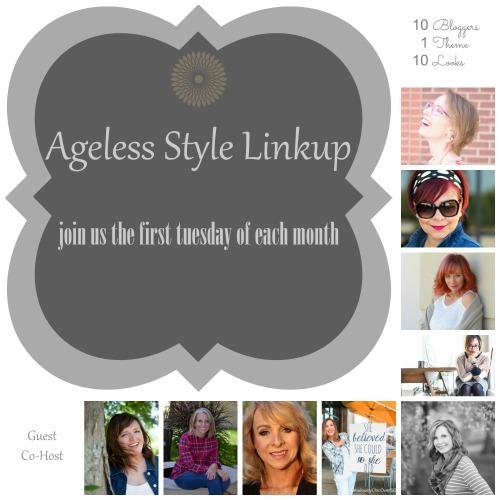 The Ageless Style Link Up is comprised of ten, over-40 women who present a different style theme on the first Tuesday of every month and show you a variety of ways to wear it. This was a little tricky because what I thought was pressed rose, was most definitely not when I compared my photos to the swatches. At least that gives me a post for another day! Believe it or not (and I think you should believe it) the Lucky Brand t-shirt from my Embroidered Graphic T and Coral Pants, fit with Pressed Rose, not Living Coral. Let's just call this shirt a bit of a chameleon. You already know the outfit began with my (chameleon) Lucky Brand embroidered t-shirt. (If you are interested in this t-shirt, I would suggest you hop over there, now, and take a look at it--it's discounted by 40%.) I wanted to throw on my most comfortable, reliable jeans, so added these Vintage American from last year. I think the floral belt is from Nordstrom Rack. Ya'll are familiar with my Sbicca floral booties. This is the first appearance on the blog for this cabi kimono cardigan in the color brick dust. It was purchased at the outlet on my last TX trip. Since I'm all about tonal, I added rose gold jewelry. How will you be wearing or interpreting the Pressed Rose color this year? If you haven't already done so, please link up with us below.